The American obsession for buying on credit has long been embedded in the national culture. However, many people do not realize just how far back such consumer practices go. Already at the turn of the twentieth century, Americans were acquiring a buy-now, pay-later mentality. Marketing professor James A. Roberts reports that over the period 1898-1916, Americans doubled their purchases of high-ticket items such as automobiles and appliances. Many of these were bought on installment plans. Roberts notes the desire to acquire an automobile was a special inducement to installment buying with nearly 75 percent of all automobiles being bought on credit by 1924. In those early times, the passion to own an automobile was so great that “people were willing to sacrifice food, clothing, and even savings to own a car (p. 36).” Some even mortgaged their homes to acquire a car. Monthly payments often absorbed one week’s wages each month for the average working man. Thus, it should be no surprise that modern consumers are so heavily indebted and that frenetic intemperance is so deeply entrenched in today’s economy. It is part of a culture that has been long in the making. 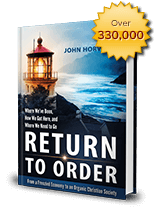 This entry was posted in Featured and tagged frenetic intemperance, Order, organic Christian society, Return to Order, rule of money, Sequester, stock market, tradition, Traditional marriage, Trust by John Horvat II. Bookmark the permalink.